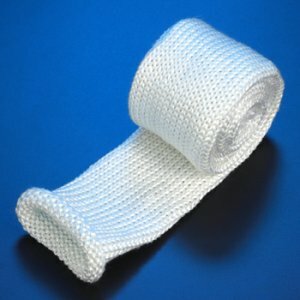 This high temperature, heat & flame resistant knitted fiberglass sleeve is fabricated from high quality type E fiberglass that will not burn and will withstand continuous exposure to temperatures of 1200°F / 648°C. This high temperature sleeve provides protection for industrial wires, cables, hoses (hydraulics), tubing and pipes, along with providing thermal insulation and personnel protection. Fiberglass offers excellent heat resistance, retaining more than half of its room temperature tensile strength at 675°F / 357°C, and more than 25% at 875°F / 468°C. It begins to soften at 1500°F / 815°C and melts near 2050°F / 1121°C. Non-combustible; high resistance to chemicals and unaffected by UV light.